We have a mid-week service of Holy Communion each Wednesday at 8:30 AM. Service includes a short homily and lasts approximately 35 minutes. Please join us for this time of devotion and refreshment. 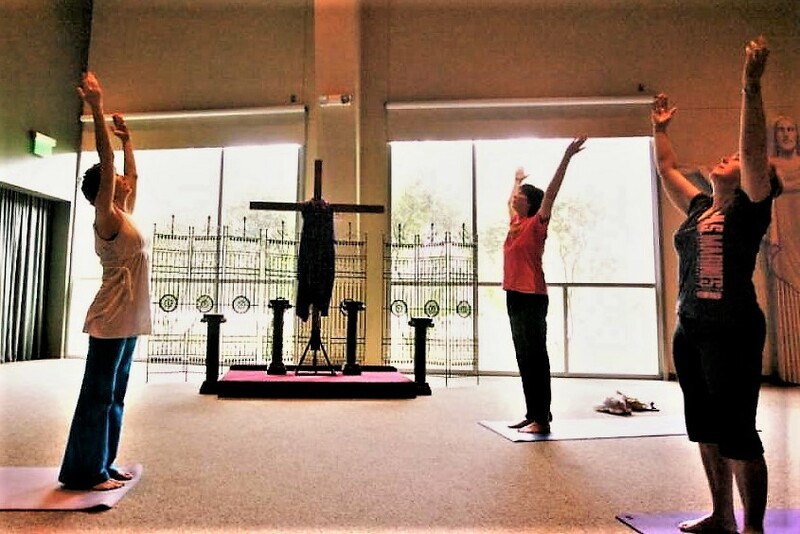 Wholy Fit, a Biblical alternative to yoga, meets Friday mornings, 8:15-9:15 AM in the sanctuary. Bring a yoga mat. Cost is $7/class or $20/month. All are welcome. We celebrate our Lord’s resurrection and the beginning of Eastertide with these words, “Alleluia! Christ is risen! The Lord is risen indeed! Alleluia!” We will proclaim these glorious words for the next seven weeks, remembering that God has brought us full circle: from the ash heap of our lives of Ash Wednesday into the fullness of life and joy. God does, indeed, have the final word, and He does so in the resurrection of His Son, Jesus Christ! The Paschal Candle burns during Eastertide, symbolizing our eternal life in Christ. During these 50 days of Easter, the early Church, as a tangible proclamation of the Lord’s resurrection, would suspend saying the Confession and stand throughout their worship services, singing additional songs and hymns. The stone is rolled away, and the tomb is empty! Alleluia! Christ is risen! The Lord is risen indeed! Alleluia! Hi all! Join us at the Panther Creek Starbucks this Friday (4/26) for gender-specific Bible Study. We will meet from 6:00-7:30, discuss and read scripture in a public setting. Jon will lead the boys, and Lauren (his wife) will lead the girls. Bring $$ for drinks/snacks and bring a Bible. You know, the book considered the cornerstone of western civilization. We hope to see you there! Please hold April 27th on your calendars as HopePointe's Pastorate community has scheduled a work day at theLove Fosters Hope transition house. The transition house in located just east of Oak Ridge North and is where foster children who have aged out of the foster program live until they move to their new residence. We have a number of landscaping, painting, and small carpentry projects that we will be tackling from 8:00 AM-2:00 PM. If you are able to join us please let Amber Galloway, argalloway@gmail.com or Tom Swinchatt, tpswinchatt@gmail.com know by April 20th. The THIRD THURSDAY of each month is our Story night. We will gather in the home of Laura Lea Palmer @ 7-8:30pm, for sweet fellowship and the opportunity to hear Pam Sneed’s story. We build relationships by encouraging one another, and experiencing refreshment for the soul. Daughters of Hope is part of The Order of the Daughters of the Holy Cross, an all female order in ACNA where Anglican women take a four fold vow of prayer, service, study, and evangelism. At HopePointe, our chapter is named Daughters of Hope and meets the fourth Monday evening of each month at different homes. If you would like more information about the process of joining this order, please contact Elaine Kirten, johnkirten0741@comcast.net. Soul in the City 2019 (SitC), the first of two major trips for our youth this summer is now being promoted. Our Bishop has asked that we send as many students as possible to this event. It's also a unique opportunity for students to meet up with other churches in the diocese. If you have any more questions regarding anything related to SitC, don't hesitate to reach out to Youth Pastor, Jon Beadle, jbeadle@hopepointe.org.